How many trees were cut down to make the big dumb phone book that was delivered recently to my front door? Well I found the answer via the Internet. 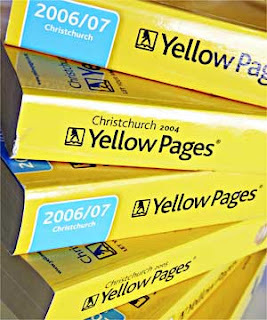 For those who work at Yellow Pages I'll explain -- the World Wide Web is where people get all their information. Ya know, like all the information that is in the big dumb phone book you just delivered to my doorstep? To stop receiving unwanted phone books click here. The information you received from that website is bogus. While they like to spread a popular myth that the industry is responsible for the neutering of forests, the reality is the Yellow Pages industry doesn’t knock down any trees for its paper!!! Let me repeat that – they don’t need to cut any trees for their paper supply. Currently, on average, most publishers are using about 40% recycled material (from the newspapers and magazines you are recycling curbside), and the other 60% comes from wood chips and waste products of the lumber industry. If you take a round tree and make square or rectangular lumber from it, you get plenty of chips and other waste. Those by-products make up the other 60% of the raw material needed. Note that these waste products created in lumber milling would normally end up in landfills.